Our Laser is used to remove dark spots on the face and body, including age spots, sun spots, and freckles revealing a more clear, even, and youthful skin tone. Dark spots or hyperpigmentation, is caused by the overproduction of melanin, the natural pigment found in skin which determines everyone’s eye, hair, and skin color. The most common cause of hyperpigmentation is sun exposure, but other common contributors are hormonal changes, pregnancy, acne, allergies, and other trauma to the skin. Our laser is attracted to the melanin and pulls it to the surface, eliminating the dark spot. After your treatment the skin surrounding your dark spot will be slightly red and any dark spots treated will be darkened. After a few hours post treatment the redness will subside. During week one your dark spot will appear as dark brown "speckles," and then will "flake off" during weeks 1-3. During weeks 1-3 you will notice your dark spot has significantly faded or has completely disappeared. What is the difference between Dark Spot Removal Treatment and a Photofacial? Dark Spot Removal Treatment targets only individual dark spots on the face/body. A photo facial treats the entire face for individuals who wish to not only eliminate their facial dark spot/ redness, but also to improve, tone, clarity, elasticity, and or acne. Depending on the client's skin type and dark spot size, will determine how many treatments will be needed. The average client will need between 1-2 treatments to completely remove their dark spot. How do I know if it is safe to treat my dark spot? 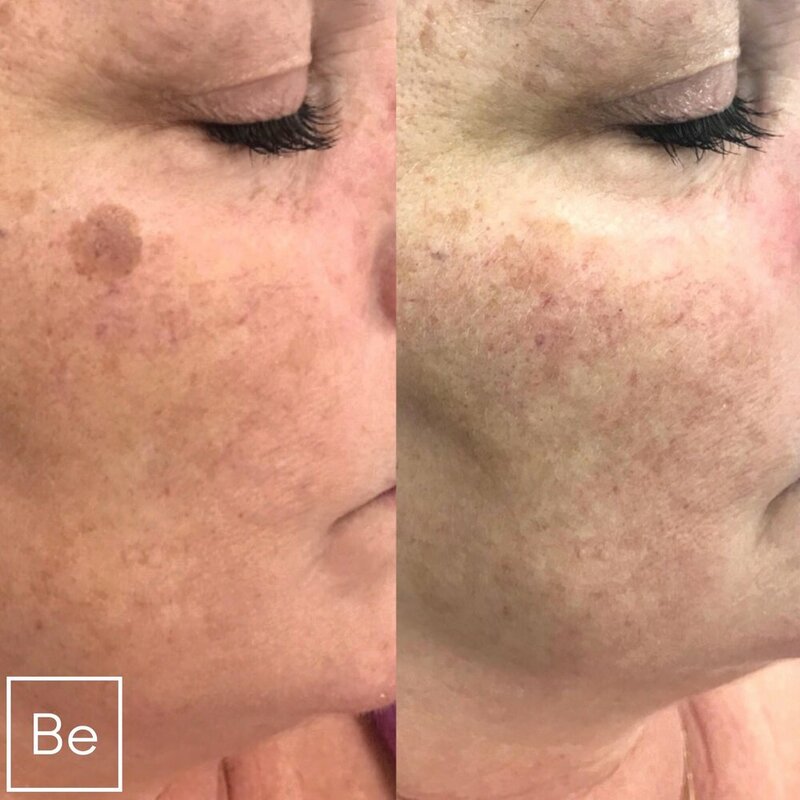 Your dark spot will be evaluated by our Laser RN, if the dark spot is not a benign pigmented lesion (safe to treat) you will be notified and referred to a Dermatologist. Clients describe the feeling of a warm pulse sensation on their face. Areas with more adipose tissue will be less sensitive and may not hurt at all, while areas near the forehead/ hairline will be more sensitive . After the treatment your skin will feel slightly tight and will feel as if you have a mild sunburn, this will subside in a few hours. Cooling agents will be applied to your face for comfort. Who will perform this treatment on me? What do I need to know before my dark spot removal? Avoid the sun or indoor tanning salons for 4-6 weeks before your treatment. If you will be in the sun, use sunblock with 50 SPF on your face. If you come in with a tan or sunburn, for safety reasons, you will need to come back in for your treatment at a later time. DO NOT use sunless tanning products for 2-4 weeks prior to your appointment. If self tanner is present you will have to come back at a later time for safety reasons. DO NOT apply any products to your face. This includes, makeup, lotion, and toner. Discontinue the use of any topical prescription medications 7 days before treatment. For example, Retin-A, Trilumen, Differin, etc. You cannot have this treatment done if you are on a photosensitizing medication. If you have a history of coldsores you must take antiviral medication for 3 days prior to your appointment. Are there any restrictions after my dark spot removal? It is EXTREMELY important for our clients to understand that laser light causes heat within the skin. For 48 hours post treatment, you must refrain from adding "extra" heat from other sources which can cause a burn. This additional heat can come from the sun, working out, hot showers, saunas, and hot tubs. DO NOT work out, participate in strenuous activity, use a hot tub, or use a sauna for 48 hours post treatment. Do not apply make-up for 24 hours post treatment, you may apply moisutrizer. DO NOT go in the sun at all 1 week post treatment, thereafter in-between your treatments use a sunblock with 50 SPF if you will be in the sun.